You still have time to put your bird in a brine bath and get it ready to barbecue tomorrow. 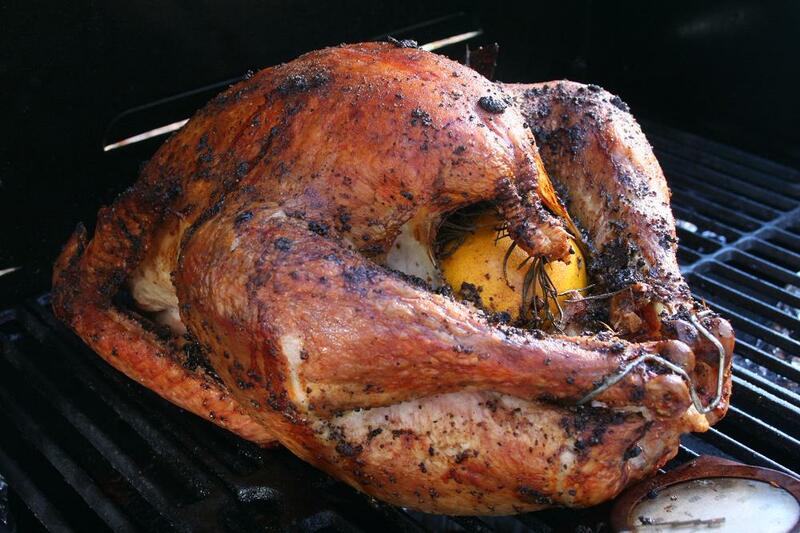 Barbecued turkey is delicious and keeps the oven free for all the other Thanksgiving delicacies, which is convenient. Need a recipe? You could do a lot worse than this one for Bourbon-Brined Smoked Turkey. If you don’t have an actual smoker, you can follow this basic recipe but cook over indirect heat on a Weber or even a gas grill (I’ll confess that the latter is all I have the time/patience for on Thanksgiving). Also, you can raise the temperature up to 300 or so without burning the bird. If you want to get fancy, and have a thing for needles, I recommend using a flavor injector to add basting liquid (chicken broth with herbs and melted butter works great) into the bird’s thighs and breast before putting on the grill. However you cook your bird, HAPPY THANKSGIVING! This year, we deep fried ours (two of them). But, I still think the best Thanksgiving turkey we had was the one we cooked out years ago on the patio on a smoker (in sub-freezing weather, no less) because the oven had gone out that morning. BBQ turkey is the king!